Speaking at the opening plenary of Harvard University’s 20th annual social enterprise conference, author and social critic Anand Giridharadas called for jettisoning impact rhetoric and placing our energy instead into social movements, political activism, and structural change. Billionaires Focus Their Philanthropy on Education, But Will Children Benefit? As with his fellow billionaires, the entry of Jeff Bezos into education philanthropy poses difficult questions about how to maintain democratic control over public education. As we go into intensive fundraising season, some may be wondering about trends they see in individual giving. 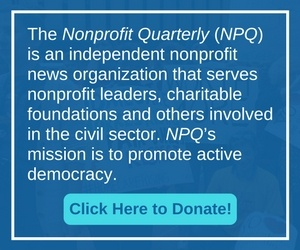 We want to encourage all of our readers to stay in touch with us on this, so that NPQ can integrate your intelligence into our coverage of the issue. In this article, Dr. Patrick Rooney reveals that small and mid-size donations are falling even as charitable dollars continue to grow, increasing nonprofit dependence on the wealthy few. As we have written many times before, the super-rich may put on their pants one leg at a time, but they give differently from the rest of us. What does it mean to be a “customer” when you have absolutely no financial sway? Plutocracy is no longer creeping up on us—it is here, riding proudly and openly atop its tax privileges. Does the nonprofit sector care? Is philanthropy the right approach to the problem of soaring tuition at colleges and universities? Hewlett Foundation president Larry Kramer notes that the “balance” between what grantees say and how foundations act is off and needs to be corrected.